After many years of constant snoring by my husband, the snoring became so loud that I was unable to sleep at all. It was then that I noticed he would stop breathing for long periods and then start gasping for breath. I'd shake him and he would resume breathing normally for a while. This would repeat every 15 minutes throughout the night. He had no recollection of this happening to him, but it was very distressing for me. 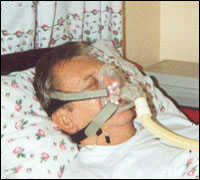 I insisted that he seek medical advice and following a sleep study, he was diagnosed as having severe Obstructive Sleep Apnoea. After 3 years of unsuccessful operations and treatments, he was finally given a tracheostomy which is a total, yet very drastic cure. This was something completely new to us and has now changed our lives, Sandra. I hope you have found this site informative, yet interesting and worth the visit. Please return again soon as I'm constantly updating and adding information, photos etc. Or maybe you'd like to contribute your own article about any sleep problems to the Visitors Own Blogs section. The photo (right) is a Nasal mask and chin strap. The chin strap stops the mouth falling open while you are asleep. 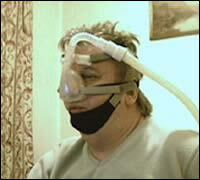 The photo (left) is a Pilot type mask, for use when a patient cannot breathe enough through their nose. Now try to get a good nights sleep!